We have a tendency to think that "quantum mechanics" is synonymous with "out of the ordinary." I do that, too, since there's so much strange to talk about: the blurring of particles and waves, the apparent randomness that drove Einstein crazy, and so forth. It's easy to forget that quantum mechanics also is an everyday matter. The odds are pretty good you're reading this post on a computer screen (as opposed to a printout), and possibly the light you're using is fluorescent. The three major types of lights you can buy are incandescent bulbs, fluorescent lights (including compact fluorescent lights), and light-emitting diodes. Incandescent bulbs are the "normal" type (though they are becoming less so): They light up when an electric current runs through a thin wire made of tungsten, which heats up. The wattage of an incandescent is a measure of how much power it consumes, and most of that power goes to heat, not light, which is why you can burn your hand if you touch a bulb that's been on any length of time. Because of the wasteful nature of that kind of bulb, a lot of people have made the switch to compact fluorescent lights (CFLs), which don't run hot and use a lot less power for the same amount of light. And they work by using quantum mechanics! Of course even incandescent bulbs are quantum-mechanical underneath: after all, everything is quantum if you examine it closely enough. The everyday stuff of our lives is made of atoms, which are built up of protons, neutrons, and electrons, governed by the laws of quantum mechanics. However, the details of quantum mechanics often get blurred out, since we are big (relatively speaking) and atoms are small. We can't ignore quantum effects for fluorescent lights, though: The structure of atoms is what enables them to be higher efficiency than their incandescent cousins. A s you probably remember from school, atoms consist of a nucleus (containing protons and neutrons, which are relatively heavy) and electrons orbiting the nucleus. Electrons can only orbit at certain distances in specific patterns, which are dictated by the kind of atom: Hydrogen is different from helium, both of which are different from oxygen or mercury or sodium. I like to use a bookshelf analogy: The books can only lie on shelves, not at arbitrary points in midair. Different bookshelves may have different numbers and configurations of shelves. Lifting a book from a low shelf to a high shelf requires energy from you, just as moving an electron from a lower energy orbit to a higher energy orbit requires energy from outside the atom. 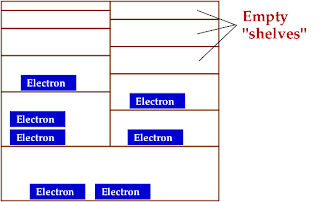 In a real atom, the outside energy can come from collisions with other atoms, or from bombardment by photons (particles of light) or electrons. The difference between a bookshelf and an atom lies in how the electron behaves once it is in a higher-energy orbit: If there is any available space left in a lower “shelf”, the electron jumps back down, emitting a photon. A lot of quantum mechanics involves calculating exactly what energies are involved in making those transitions: which ones are allowed and which are forbidden. We won't worry about that! All we care about is that atoms can absorb and emit only certain quantities (which is where the quantum in quantum mechanics comes from) of energy, and those quantities are determined by the type of atom. Big jumps in energy will correspond to ultraviolet light, while moderate jumps are visible light, and small jumps involve infrared light. That's a lot of quantum mechanics in two short paragraphs, but it's most of what we need to understand fluorescent lights. Inside a fluorescent bulb (whether a big tube or a CFL), there's a very small amount of mercury, which is liquid at room temperatures. Electrodes at either end of the tube boil off electrons that collide with the mercury atoms, turning the liquid into a gas and kicking electrons into higher-energy states. Mercury produces a lot of photons in the ultraviolet and blue-light parts of the spectrum: a bare mercury bulb appears blue. Fluorescent lights have a coating called the phosphor, which absorbs that ultraviolet light and glows with visible light instead, losing the extra energy to heat (though a lot less than in incandescents). I'm skipping over a lot of details (mostly involving how the bulbs regulate the flow of electrons through the tube – that's where the “ballast” comes in) but that's the basic idea. Fluorescent lights are more efficient than incandescents because the energy mostly goes directly into making the mercury glow, not into heating up a filiment. By using the quantum-mechanical properties of atoms, fluorescent lights are less hot, more energy efficient, and last longer. Quantum mechanics isn't just weird--it's practical! @patrick We are sorry to hear that. We have checked the post in both IE and Chrome, and the images appear for us. 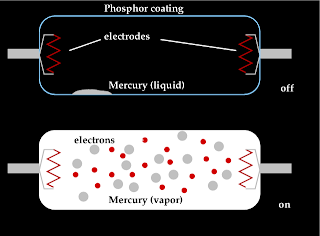 I believe you skipped over the part which describes how the high energy UV photons strike the phosphor coating, knocking the electrons in those atoms to a higher state, when they return they re-emit the lower energy photons in the visible spectrum. The fluorescence is the interesting part. Why do they re-emit when they continue to be bombarded with higher energy photons? Do the books return to the lower levels?